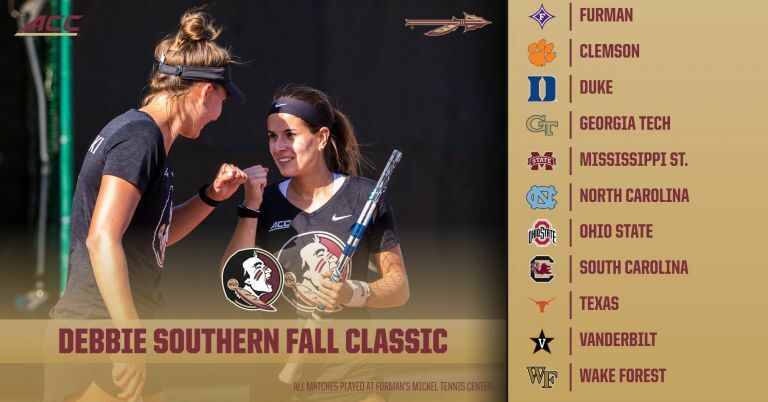 GREENVILLE, S.C. – The Florida State women’s tennis team kicks off its 2018 fall season on Friday as they head to Greenville, S.C. to compete in the Debbie Southern Fall Classic hosted by Furman (Sept. 21-23). The field is comprised of 12 teams that will compete in flighted competition with no team winners just individual flight winners. Florida State will be joined by 10 teams that finished the 2018 season in the ITA rankings including Clemson (38), Duke (4), Georgia Tech (5), Mississippi State (29), North Carolina (3), Ohio State (33), South Carolina (12), Texas (6), Vanderbilt (2) and Wake Forest (27) to go along with tournament host Furman. “We are very excited to get to South Carolina,” said head coach Jennifer Hyde. “We have been working hard the last couple weeks so it is going to be fantastic to compete against other teams. This is probably one of the best fall events in the country as far as the depth of the teams goes. All of the draws are going to be stacked with some of the best players in college tennis. Doubles play is set to begin at 9 a.m. on Friday with singles starting at 1 p.m. Play is set to begin on both Saturday and Sunday at 9 a.m. as well. Newcomers Ana Oparenovic and Emmanuelle Salas look to get their first taste of what it is like to play tennis in the Garnet and Gold, while the rest of the team looks to build on a season ago that resulted in the best finish in program history. The Seminoles look to reach the NCAA postseason for the third consecutive season and advance even further than a season ago. Florida State returns seven of 10 players from last season’s team that went 21-9 and went all of the way to the Elite.